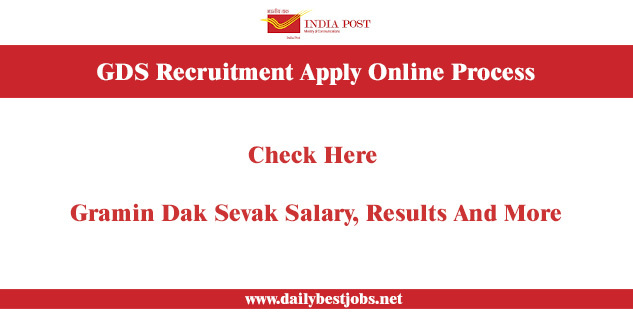 India Post Online Gramin Dak Sevak Recruitment 2017: India Post Online GDS provides an opportunity by sharing recruitment notification for Bihar and Chattisgarh Gramin Dak Sevak. In a previous Job notification, there were no vacancies in both states. Now you can apply online GDS Recruitment 2017 for Bihar and Chattisgarh regions until till October 2017. Many of the location has open new vacancies for Gramin Dak Sevak 2017 recruitment. You can check all the required details of Gamin Dak Sevak Vacancies, GDS Apply Online, GDS Result 2017, Gramin Dak Sevak Salary, GDS Online, GDS Merit List, and GDS Result Date. In case if you haven't applied for Indian Post Gramin Dak 2017 recruitment yet, check here the GDS application form and apply online now for various State-wise India Post vacancies. Now, You can apply below for GDS recruitment 2017. This is GDS Recruitment 2017 apply online for Gramin Dak Sevak (GDS Recruitment) 2017. You can check here how to apply Gramin Dak Sevak Vacancies online. First, open the official website of Indian Post GDS. Then go on the registration part. Fill all the details in the registration section. Submit your details and get the registration number. After that check application online. Fill all the details and finally click to apply. (i) You should have passed minimum10th class from any State Board or Central Board which is approved by Indian Government. (ii) All candidates must have proper computer knowledge. (iii) If any candidate who had cleared 10th class in the first attempt will be given first preference. (iv) The minimum age limit requirement is 18 years and the maximum age is 40 years. This is also applicable to general category kind of candidates. The Age Limit is 18 years which is minimum and 40 years which is maximum for Gramin Dak Sevak Recruitment 2017. You should know age relaxation for the recruitment of Gramin Dak Sevak. For OBC candidates have 3 years of age relaxation, SC or ST has 5 years of age relaxation and PH candidates having 10 years of age relaxation. The total Vacancy is more than 17000 for Indian Post Gramin Dak Sevak. These posts are different from all states of India. There will be no any written exam. The selection process for GDS will be according to the merit list based on marks secured in 10th Class. The 10th class percentage will be recognized for the final selection in GDS Recruitment 2017. The GDS application fee for OBC and Unreserved is Rs.100 only. There is no fee for SC, ST, Female for the application of Gramin Dak Sevak. The result for Gramin Dak Sevak 2017 will be updated here. You have to come back & check here GDS Result Date 2017. The salary pay of Gramin Dak Sevak starts from Rs. 10,000 per month which will raise maximum up to Rs.35,480. You have to check Gramin Dak Sevak Salary as per your particular state or region. We will share more about GDS Recruitment 2017 Apply Online at Gramin Dak Sevak Recruitment till you can subscribe your email address to get an update directly to your Email ID. Find more latest jobs recruitment in our website search box. You can free feel to share this post on social sites with your friends and bookmark our site for next time visit.